My presentation will discuss the background and methods I am using to write my musical Napoléon: Les Cent-Jours. 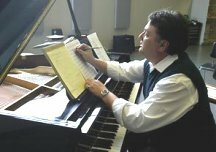 This will include where I got the idea, an outline of the story I am using and techniques I use to compose the music. Sean Richarz has had an interest in both music and Napoleon since a young age. He started playing trumpet at age 12, and began writing and arranging music in college. He holds a B.A. in Music Education and an M.A. in Music Composition. He has written numerous works for all types of mediums, including the musical “Rising Star”. His idea for a work about Napoleon came from the old adage ‘write what you know’ and his desire to tell the story of this fascinating man in a new and interesting way. His is currently the head of the Performing Arts Department at Bishop Blanchet High School and frequently does guest lectures on Napoleon in the History and French classes at the school. He also continues to work in the Seattle area as a trumpet player and conductor. Sean has performed his music at the Napoleonic Historical Society conference in Seattle, the Olympia World Affairs Council French Dinner, and the International Napoleonic Society Congress in Ajaccio.